An eight-figure pass has been completed just west of Mile High Stadium. UDR, a Highlands Ranch-based developer, paid $13.2 million last week for 1570 N. Grove St. and 3030 W. 16th Ave., a triangular parking lot northwest of the Colfax Avenue-Federal Boulevard interchange, according to county records. The company plans to build an apartment complex at the 2.1-acre site. It submitted a site-development plan to the city last June, proposing a 285-unit complex with 350 parking spaces. The complex would top out at seven stories. UDR purchased the property from JP Grove LLC, an entity affiliated with Jordon Perlmutter & Co., which bought the site from JR Holdings LLC for $6.9 million immediately prior to the sale to UDR, according to records. UDR owns apartment complexes in major cities across the country. In Denver, it owns two, Acoma at 816 Acoma St. in the Golden Triangle and Steele Creek at 3222 E. 1st Ave. in Cherry Creek. A UDR executive did not respond to a request for comment. 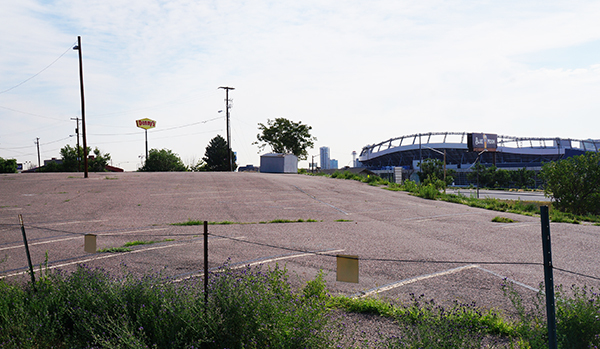 UDR’s plan is separate from another proposal to repurpose parking lots near the Broncos stadium. The team has proposed creating an entertainment district south of Mile High. 1 Comment on "Apartment developer pays $13M for lot west of Mile High Stadium"
Why only 7 stories high? In 10 years there will be regrets for not building higher. Also too many parking spaces. I hope that Denver would have private business to rent out parking spaces in condo’s instead of automatically offering a space to occupants. In city public transportation would benefit. Denver parking lots are such an eye sore and waste of space.